Norwich City have started work at Carrow Road as the club expand the capacity of their ground to 27,000. "Every stand is being affected and we are installing new seats," said customer service manager Richard Gough. The Canaries' average attendance this term was 24,755, with the current capacity being 25,900. "The Norwich and Peterborough Stand is slightly different because we have reconfigured the existing seats, but the others get new rows," said Gough. Chairman Alan Bowkett announced the plans to expand Carrow Road in a recent webchat on the club's official website. "We hope to be able to increase capacity for the coming season to 27,000," said Bowkett. "This will cost money so there will not be extra cash from seats this year." Bowkett added that all of the extra seats will be in home areas of the ground. 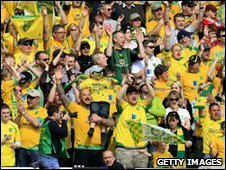 The Norwich chairman went on to suggest that Carrow Road could one day hold 35,000 spectators, should the club ever regain a place in the Premier League. He said: "Our calculations indicate that if we were able to fill a 35,000 capacity stadium in the Premier League, we could be self-financing and be competitive in that league. "We do have a vision, we have calculated the finances necessary, but our overriding key objective for the coming season is to do well at football." Bowkett added that the club was continuing to talk to Newcastle about bringing goalkeeper Fraser Forster back on loan. He also revealed board members were in discussions with potential investors and that appointing a new head scout was a top priority.